As far as the near-term outlook for asset prices is concerned, I believe that the path of global inflation is more important than the prospects for global growth. I reviewed the consensus forecast on global growth in a recent post, so now I turn to the inflation outlook. Last year, I presented the consensus outlook for inflation and, motivated by an insightful piece by Russell Napier which argued the case for strong global deflationary pressures, I also laid out an Inflation Scenario and a Deflation Scenario. By the end of 2014, Napier's prediction of a deflationary scenario was clearly playing out. Inflation drivers are much weaker in EM than in DM. Global inflation has consistently fallen short of expectations since 2013. This has occurred in spite of unprecedented efforts by central banks – in the form of negative real interest rates and massive Quantitative Easing – to fight disinflation. Last year, global inflation for the entire set of world economies was expected by the IMF to edge up from 3.7% at the end of 2013 to 3.8% by the end of 2014. By October 2014, the IMF had lifted its year-end 2015 forecast to 3.9%. Meanwhile, a year ago, JP Morgan economists expected their measure of global inflation (for 39 major economies) to edge up to 2.9% in 4Q14 from 2.8% in 4Q13. 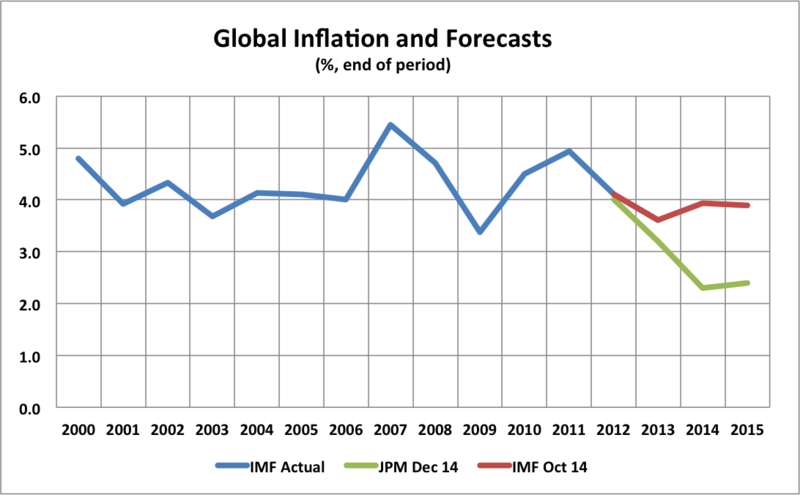 JPM economists now expect that global inflation fell to 2.3% in 4Q14. JPM's 2015 global inflation forecast is now 2.4%, which appears to be the lowest forecast on record. But these forecasts, made between early October and mid-December, were already DOA*. While crude oil prices had already dropped sharply to around $65 per barrel in mid-December from around $95 per barrel in early September, economists were just beginning to factor in the impact that lower fuel prices would have on inflation. Since then, the price of crude has dipped below $50/bbl and looks likely to remain depressed for a considerable period of time. In most countries, inflation can be expected to be weaker than the consensus forecasts. While US growth has picked up, growth in the Eurozone, Japan and most emerging markets has been disappointing and still shows signs of slowing. Considerable slack remains in the global economy. Wages are not accelerating. Commodity prices, led by crude oil, are plunging. Inflation expectations are falling. Deflationary forces are becoming entrenched despite central bank efforts. Inflation in Developed Market (DM) economies fell to just 1.2% in 2013 and remained unchanged in 2014, undershooting forecasts made a year ago by JPM (1.7%) and the IMF (1.9%). 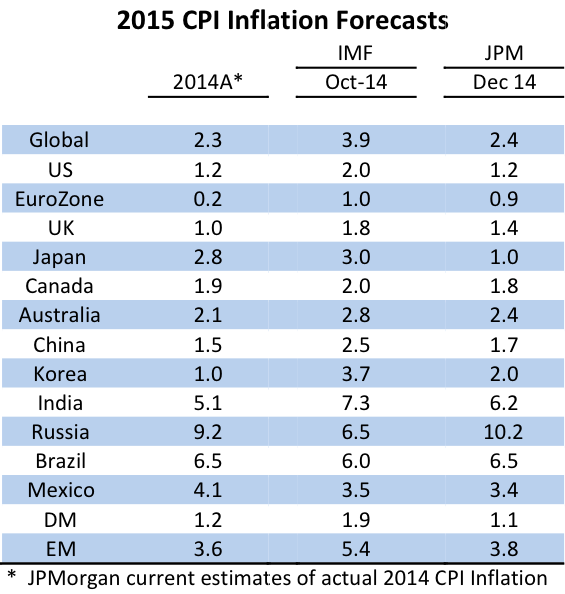 In 2015, JPM now expects DM inflation to edge down to 1.1%. The IMF estimate, reflecting a slightly broader definition of which economies qualify as DM, is for inflation to rise from 1.7% in 2014 to 1.9% in 2015. Inflation in Emerging Market (EM) economies fell to 3.6% in 4Q14, according to JPM’s estimate, undershooting its forecast made a year ago of 4.2%. In 2015, JPM expects EM inflation to rise to 3.8%, while the IMF estimate (for a broader group of countries) is for a decline from 5.7% at year-end 2014 to 5.4% at the end of 2015. The balance between aggregate supply and aggregate demand is only one driver of inflation and often is not the most influential factor. The concept of an economy’s domestic capacity (or output gap) is of declining importance in world of globalized supply chains. 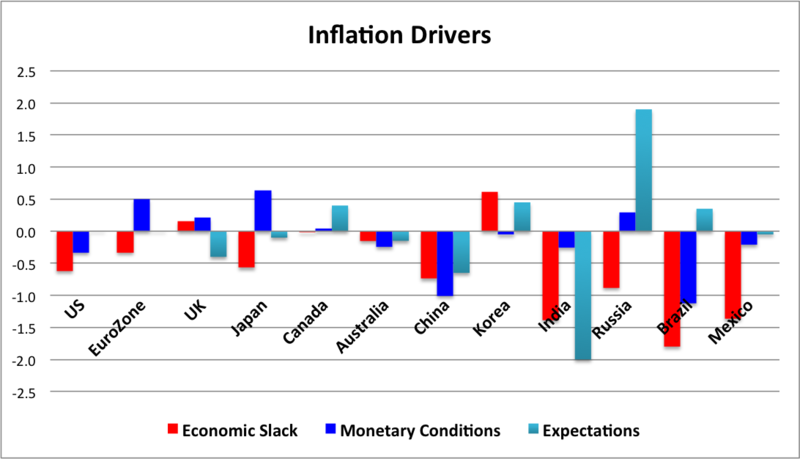 The chart below shows my rough estimates of several inflation drivers in the major economies. They combine the effects of an estimate of economic slack; monetary conditions (the combined effect of the real central bank policy rate and movements in the foreign exchange rate); and changes in inflation expectations. Before going further, I would caution that I have normalized and weighted the contributions from the various drivers in a consistent but subjective fashion that accords with my judgment. The scale of the chart has less meaning than the direction of the impact of each of the drivers for the individual countries. Given the preceding caveat, the chart suggests that the largest downward push on inflation in the DM economies is occurring in the United States. The US economy is expected to grow above trend but still has a large output gap, so economic slack remains a deflationary force. Monetary conditions are tightening as the real policy rate rises and the US dollar has appreciated against most world currencies. Inflation expectations are stable based on the the consensus inflation forecast but are declining based on breakeven inflation rates between nominal US Treasuries and TIPs. In the UK, where the Bank of England backed away from its intentions to raise the policy rate in 2014, economic slack and monetary conditions both point to slight upward pressure on inflation but expectations point solidly in the other direction. In the Eurozone, where inflation has already turned negative, economic slack still weighs on inflation and inflation expectations are stuck around zero. Monetary conditions, with a zero real policy rate and depreciating currency, are supportive but not strong enough to move inflation higher. In Japan, weak growth, economic slack and weak inflation expectations continue to weigh on inflation while highly stimulative monetary conditions, mainly achieved by the weakening of the Yen, struggle to turn the tide. In Canada, neither economic slack nor monetary conditions are providing much impetus to inflation. On the monetary front, Canada has one of the highest real policy rates among DM countries but has experienced a sharp currency depreciation as the terms of trade have weakened. Inflation expectations were rising gradually prior to the recent plunge in crude oil prices, but this is likely to change as inflation forecasts are marked down over the next month or so to reflect lower energy prices. Similarly, Australia appears subject to moderate deflationary impulses. Among the EM economies, deflation pressures seem strong in China, India, Brazil and Mexico. Growth is running below trend in all of these economies and slack is developing. Monetary conditions are disinflationary in all four economies. Inflation expectations appear to be falling in China, India and Mexico. The exceptions in the EM economies are Korea, where the economy has been operating above trend, and Russia, where currency depreciation has fuelled strong inflation expectations. Global inflation appears likely to fall to a new record low in 2015. The plunge in the price of crude oil has not yet been fully factored in to 2015 inflation forecasts. In DM economies, where inflation was already low at 1.2% at the end of 2014, a sharp decline is expected in early 2015 as lower transportation and heating fuel prices feed through into consumer prices. The Eurozone's annual inflation rate dipped into negative territory in December. Japan's inflation rate could turn negative again once the effect of the 2014 consumption tax hike falls out of the calculation. Headline inflation rates are likely to fall below central bank target ranges in the UK, Canada and Australia in 1Q14. In EM economies, inflation drivers point to further downward pressure on inflation in the major economies with the exception of Russia, where currency weakness is driving up already high inflation. In this strongly deflationary environment, the consensus forecast anticipates that central banks in the US, UK, Canada, Australia, Brazil and Mexico will all raise their policy rates by 25 to 75 basis points. Barring a quick and sharp reversal in crude oil prices, such rate hikes could prove a serious policy mistake.